Sugester's interface is 100% responsive - it automatically adjusts to fit on your screen. Whether you're using a desktop, a laptop, a smartphone or a tablet, Sugester works and looks just like it should. Receiving, writing and managing e-mail out of the office is an absolute must-have, which is why Sugester lets you manage your correspondence from any web-enabled device. You need access to your customer database everywhere - not just when you're at your desk. Sugester's CRM is perfect for meetings with clients, superiors and more. 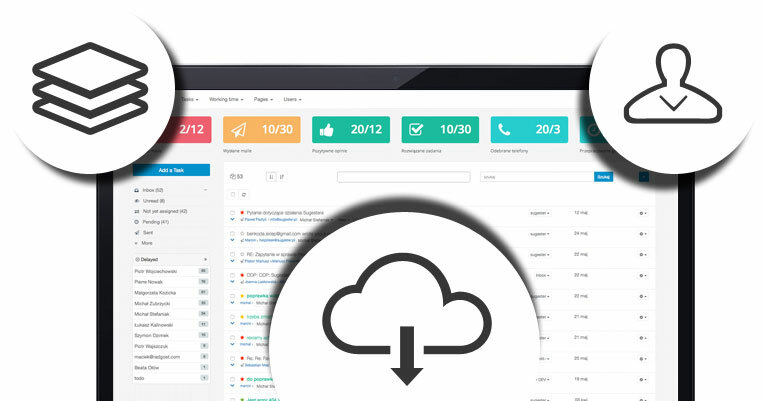 Sugester is not just e-mail and CRM - our app includes task management, cloud file storage and much more. It's all you need to get work done on the move. Mobile Sugester is a responsive website, so it's compatible with all internet-enabled devices. Whether you're using Android, iOS, Windows or any other platform, Sugester will work flawlessly - all you need is a modern web browser. We're also planning a native mobile app in the near future. You probably access the internet from multiple devices every single day. Each one has a different screen size and resolution - but it's not a problem for Sugester. Thanks to responsive design, our app looks just as good on a widescreen monitor as it does on a smartphone or tablet display. We're an established company and we treat our business very seriously. You can rest assured that our web and upcoming mobile apps will get support for years to come - we're in this for the long haul.